This is our first in a series on creating butterfly gardens. Creating an edible butterfly garden for Monarchs starts with determining which types of butterflies will be visiting your back yard. For those of us living in North and South America, one of the most commonly found butterflies is the Monarch. I saw one map that even had these beautiful black and orange butterflies reaching as far away as Australia. Seemed like a good species to build an edible butterfly garden for. Yes, milkweed is not generally considered an edible herb. But, if you want Monarch butterflies, milkweed should be part of your garden plan. The good news is that it does come in a large variety of colors and plant sizes – there are at least 110 species that grow in North America. The obvious bad news is that some varieties reproduce by both seed and rhizome and can become invasive. Milkweed generally flowers from June to August. Colors range from white to pink to bright orange. 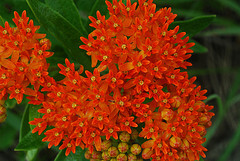 Our personal favorite is known as butterfly weed. It has bright orange blooms and is actually not considered invasive. It can be found growing in the wild but is exceptionally hard to successfully transplant. It’s better to buy plants from a reputable nursery or try your hand at growing them from seed. Why is milkweed so important to Monarch butterflies? Monarch larvae generally only feed on milkweed. Unfortunately, since many gardeners consider milkweed an invasive pest plant, it has become more and more scarce. Monarch butterfly populations have been declining and many scientists believe it is the loss of milkweed habitat that is the cause. Fennel and dill are virtually a must for anyone planting an edible butterfly garden. The large flower heads provide nectar for adult butterflies and are one of their preferred host herbs. If you’ve studied our companion planting guide, you know that fennel is one of those plants that doesn’t typically play well with others. The good news is that it does grow well with dill and both plants are butterfly favorites. They are both fairly tall and have lacy flower heads so I think they look pretty together too. Black swallowtail seems to the species of butterfly that most prefer these two highly aromatic herbs but I’ve seen several people mention that Monarch butterfly larva will eat dill in the absence of milkweed. Plant balms in your edible butterfly garden for Monarchs to provide a nectar source. It would seem that depending upon location, different varieties of balm are favored by different species of butterfly. White peacock butterflies appear to like lemon balm (Melissa officinalis) and Monarchs enjoy bee balm or Mondara didyma, like the example shown here. Thank you Joshua Mayer for sharing your lovely photo. 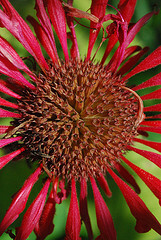 Monarda Didyma seeds are available on Amazon. From everything I’ve read lavender flowers are a favorite of most species of butterfly. Their strong fragrance and virtually year-round blooming cycle make them an excellent butterfly garden choice. Our family can truly attest to how well parsley works as a host plant for butterflies. We purchased a deeply discounted, late season potted parsley plant – it wasn’t a prime specimen by any means but hey for 25 cents we got some fresh parsley. Little did we know it had a small resident. Within a few days, that resident grew into a beautiful caterpillar that proceeded to eat the plant down to a nub. We were oddly thrilled to be hosting a swallowtail butterfly in this early stage of development. Though parsley is generally listed as a favorite of swallowtails, several gardeners and butterfly enthusiasts have reported that monarch butterflies seem to use parsley as a host plant too. If allowed to flower, the butterflies seem to also enjoy parsley flower nectar. Once you have created an edible butterfly garden for Monarchs and have enticed Monarch butterflies to your garden, be careful when it comes time to harvest your herbs. Monarch butterfly eggs are only about the size of a pin head but they are generally laid by the female in small groups. Also be careful not to carry small larvae into your kitchen when trimming off a bit of parsley for your culinary creations. 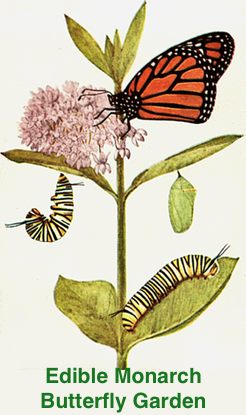 Monarch and Milkweed is a wonderfully illustrated children’s book which explains the relationship between Monarch butterflies and the milkweed plant. The book would make a wonderful gift to a child learning about gardening, how things grow and how creatures and plants need each other to survive. How much fun would it be to sit down with a child and share this book and then explore the garden looking for butterflies, their eggs, caterpillars and newly emerging butterflies just testing out their wings for the first time?